Above are lyrics from the song “Bully” by the secular band “Three Days Grace.” I think this song sends a powerful message about those on the receiving end of bullying. We were not meant to function this way and it should be no surprise when a victim finally lashes out at the bully. Bullying is very prevalent in today’s schools and it is out of control. Does the Bible cover “bullying”? Well you won’t find the word “bully” in it but you will find many stories of people who were bullies and there are lessons to be learned. For excessive typing purposes I will refer to the bully as he/him, but there are just as many girls that bully too. Let us dive into scripture and see what the Bible says on this matter. 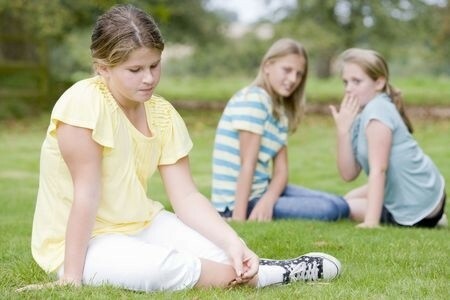 The bully is someone who enjoys causing others pain and anguish. He does not love kindness but rather hostility. Therefore he is in sin. Unless the bully repents of his wrongdoing he will face a much bigger bully in hell if he dies without accepting Jesus and changing his evil ways. These verses speak about the core of the bully’s heart. The bully is proud (haughty). He will lie. He does run sometimes to shed blood. He most definitely devises wicked plans and runs swiftly to do his evil works. The bully usually finds his self-worth in making others lower than himself. That is why he keeps bullying. It is a power trip for him. He doesn’t realize that God hates the things he is doing. Pharaoh is a perfect example of what a bully looks like. Exodus chapter 1 shows many things that Pharaoh and his men did to Israel including: dealing shrewdly with them, keeping them slaves, afflicting them with heavy burdens, making them build store cities, made their lives bitter with hard service and calling the midwives to kill all newborn boys (the midwives did not obey Pharaoh). Pharaoh oppressed them because of his power trip. He did not want to lose his dominant status. Of course we know that God did deliver the Israelites from the hands of Pharaoh and set them free. This is not the case always on earth, but be rest assured as God says, “Vengeance is Mine, and recompense, for the time when their foot shall slip; for the day of their calamity is at hand, and their doom comes swiftly.” (Deut 32:35) In the end God will make all things right. In Matthew 14:6-12 we read about Herodias, wife of King Herod, and how she used her own daughter to accomplish her wicked agenda. John the Baptist was very well known in the land. He prepared the way for Jesus to come and baptized many people. He was a threat to Herodias, in her mind. So when King Herod gave an oath to give his daughter anything she wanted, Herodias prompted her to ask for the head of John the Baptist. This way, in her mind, she would maintain power through her husband as king. This is bullying to the extreme. It is just awful to see and hear what bullying does to victims. These are only 2 precious kids that have been affected. Bullying causes severe physical, psychological, and emotional trauma to victims as clearly shown in these 2 examples. As parents, we need to stand up for our kids and do whatever we can to stop others from making victims of our children. The main thing is that at the heart of the matter bullies only focus on their own well-being at the cost of others. This sounds a lot like Satan to me. He focuses only on his own wicked schemes too at the cost of anyone he can. The Bible shows us what bullying looks like and how we are to conduct ourselves even in the midst of bullying: “But I (Jesus) say to you, ‘love your enemies and pray for those who persecute you, so that you may be sons of your Father who is in Heaven. For He makes His sun rise on the evil and on the good, and sends rain on the just and on the unjust.’” (Matthew 5:44-45) Friends we need to stand for what is right by bringing attention to the bullies to the leaders in schools, but even more importantly we need to teach our kids to memorize scripture, pray for their enemies and understand where their self-worth should come from. I know from personal experience what it is like to be bullied and it is no fun. But, my heart and soul belong to God, and this is why I am who I am today. If our sons and daughters understand that God is with them in the very hard times, it won’t necessarily take the pain of the moment away, but it will encourage them to stay strong and fight the good fight! May God continue to bless you as you live a life worthy of the calling! My daughter was bullied unrelentingly in our public high school to the point the city police had to come in and deter the bullies from their ultimate agenda, which was the demise of my daughter. I had to pull her from the situation and get her plugged into another school setting. She did her senior presentation on bullying and called upon the school principals and counselors to become more proactive in stopping bullying and in supporting the victims. Some schools have these programs in place but unfortunately they often are not enough, do not reach their intended audience, or are not enforced. As you said, it is devastating to the victims and allows the bullies to move on with their agenda. The main bully, in my daughter’s case, is seeking now, four years later, to get her teaching degree. I do not believe she has changed. So now, in this case, we have the bully, in a greater position of power, potentially furthering her agenda with a captive population of new victims. Kids want to know where God is in these difficult circumstances. We preach that He has not moved and is right here, but that often times rings hollow in the face of bullying. Yet, God is near and later they often times see that God never did move. We need to pray for these victims and their antagonists and for the administrators at schools as they all struggle with this seemingly unabating problem of bullying. Thank you for your transparency in letting me hear about your own daughter. I’m so sorry she had to go through this painful experience. I know in my own experience where I was bullied that I have become stronger as an adult and I am a HUGE supporter of the underdog. I will always fight for the underdog, in this case the victims being bullied. You are right we need to pray for everyone involved in this crazy ordeal. The great thing about God is that He always listens to us when we pray, and that is so comforting, even if the circumstances don’t change, God will always be there! Thank you again for your story. God bless you! I have been serverly bullied by my superiors at my job and one in particular. To the point where I have been separated from them. I know the Lord will bring justice to this situation. In the meantime it has meant accepting the changes that God has brought to my husband and I. As they continue to work and collect paychecks…I rejoice in God’s mercy that He moved me away from them. I was once bullied at my work. Then I appealed to my rights as a citizen of God’s kingdom and the One seated to His right, our precious King. I did not reported the bully officially. But with an open and sincere heart, not to mention pain, I came before God, expressing that the rights of one of His children had been broken. He responded…three months later, my bully got laid off. “Then your Father that sees you in secret will reward you in public.” Matthew 6:4. I found your website named https://www.whatchristianswanttoknow.com/what-does-the-bible-say-about-bullying/ that greatly motivated me because of your excellent diagram. I like your idea and style for two different sides of the Bullying and Christian’s hearts. I politely need to ask for your permission or authority to allow me to take or use your diagram to minister to my deaf Christians in my Bible Study or presentation that can be both as well. You are earned your credit that I have requested your authority to let me use that. Let me know for your permission that I am waiting. I am working on my new website project that started last week. You can email both of email address below that I filled out. Many Thanks! I appreciate your website being shown spiritually! God Bless You! Hello Mrs. Saulsberry. I think that’s fine since it’s not going to be on the Internet. Thank you for asking permission to use the chart. What a great idea and what a special ministry you have, and may God richly bless you for that Mrs. Saulsberry.